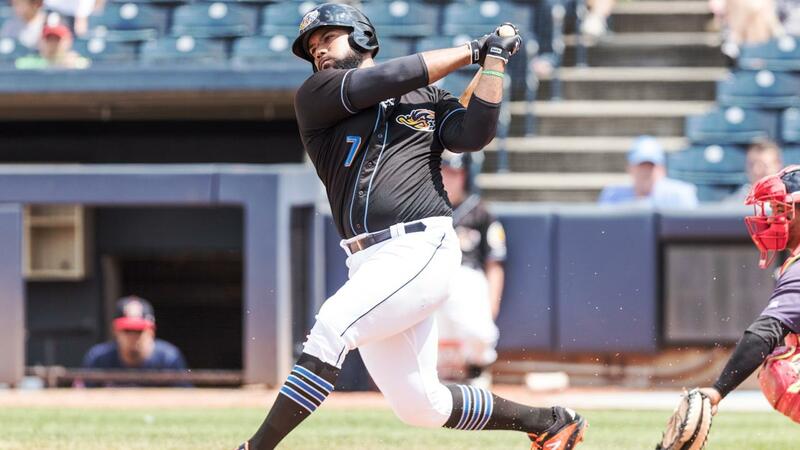 Akron's Nellie Rodriguez homered, and Mark Mathias mashed a two-out, two-run, go-ahead double, as the RubberDucks notched a 7-4 win over the Erie SeaWolves in the regular-season finale Monday afternoon at UPMC Park in Erie, Pa. The RubberDucks (78-62) scored four times against Matt Manning (0-1) in the fifth inning to wipe out a 3-2 deficit. Elvis Perez led off the inning with his first Double-A hit, a double, and scored on a double by Ernie Clement. Andrew Calica followed with an RBI single to tie the game, 4-4. Two batters later, Mathias crushed a double to left-center, chasing home two runs and giving the Ducks a 6-4 lead. Former RubberDucks ace and current Cleveland Indians pitcher Cody Anderson started the game and worked one scoreless inning on a minor league rehab appearance. Anderson has missed most of the last two seasons after elbow surgery. After the first, the Ducks pieced the rest of the game together with six relievers. Pasquale (3-3) picked up the win despite giving up a pair of runs in his 1.2 innings. DeMasi worked the final two innings, retiring all six batters he faced, to earn his first save. Rodriguez socked a solo homer in the seventh, a solo shot to right, to make it 7-4. It was his second hit of the day and fifth homer of the year. Perez was 3-4, with a double and two singles. Clement also enjoyed a three-hit day, going 3-5, with an RBI. The RubberDucks won three out of four in the series to close the regular season…Akron's 78 wins tied for 2nd-most in the EL…Game 1 of the EL Western Division playoff series is Wednesday night at 6:35 against Altoona at Canal Park…RHP Kyle Dowdy will start for Akron against Altonna lefty Cam Vieaux…The SeaWolves (63-77) finished the season tied for fifth in the EL West…Time of game: 2:53…Attendance: 5,401. The RubberDucks and Curve will open the best-of-5 ELDS at Canal Park on Wednesday night at 6:35. Akron will host Game 1 and 2. The game will be broadcast on Fox Sports 1350 AM, the WARF iHeart channel, and the TuneIn Radio App.